VPL Infotech & Consultants is a popular Exporter and Supplier of Embedded Trainer Kit (ET-PIC455). 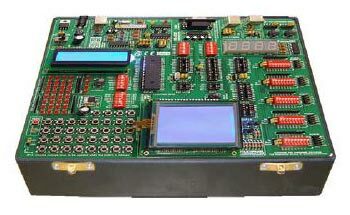 Embedded Trainer Kit (ET-PIC455) is a PIC microcontroller integrated development board for PIC18F4550. RS-232 communication with PC or another microcontroller. Crystal can be removed and replaced by another one. All pins are marked on the back of the board.